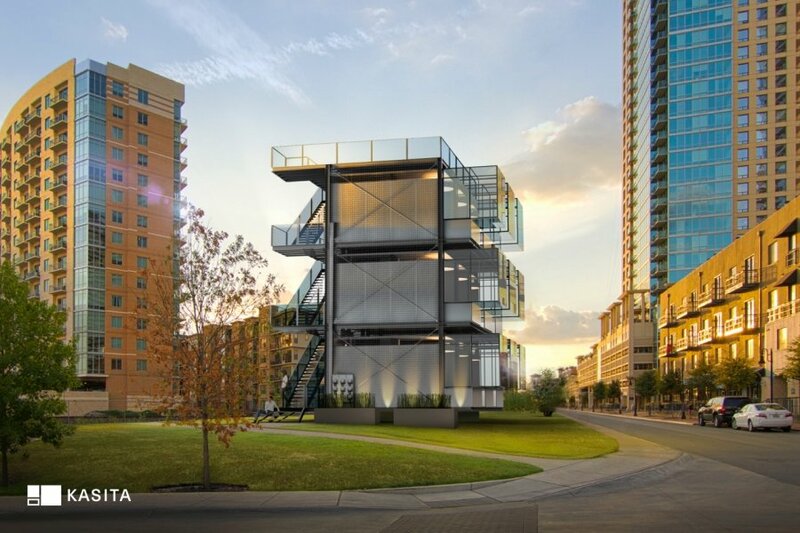 Austin, Texas, will be the first location for a new generation of compact urban houses, which are packed full of smart customizable features. Tiny houses can be a boon for many people, but they don’t mix well with cities, as most municipalities aren’t very welcoming to dwellings that don’t fit into the standard ‘box’ of residential design. 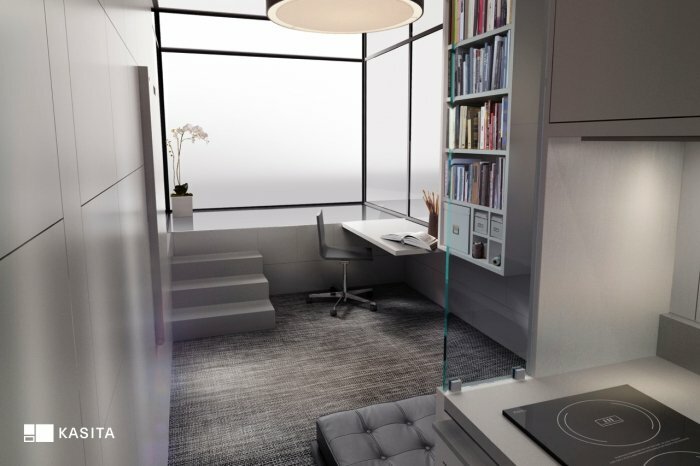 But a new type of tiny home, which is designed to be integrated into a larger “rack” of units in urban areas, and which can be moved on demand, could be the answer for minimalist city living on a budget. Jeff Wilson, AKA Professor Dumpster, has moved out of his year-long residence in a converted dumpster, and now has a new project in the works, called Kasita, and it may prove to be a viable option for tiny houses in the city, as the units aren’t meant to stand alone, but rather to be installed in an apartment-like complex with other units. And in addition to the low cost (“half the market rate of a studio apartment”) and smart design features, these Kasitas can be removed from their rack and relocated to another one with minimal fuss. The Kasita unit is a 208 square foot dwelling with 10-foot ceilings, which the company says is “about 30% bigger than a 20’ standard shipping container,” with all of the amenities you’d expect in a home included, such as a full kitchen, dishwasher, bathroom and shower, and washer/dryer. The units are meant to be inserted into the rack, where utility connections will provide water, electric, etc., with the glass-fronted end cantilevered out from the structure. The units will be able to be disconnected and moved to a new rack or new city, sort of like a high-tech mobile home, assuming there are other racks built and available for them. 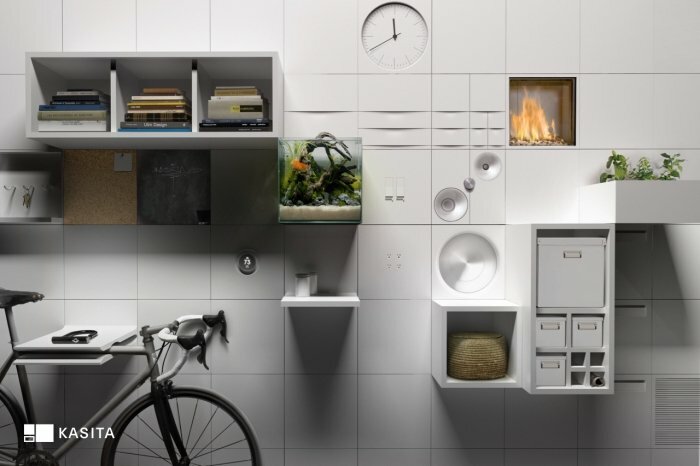 The walls serve as modular grids for the Kasita Tiles system, which is claimed to enable “virtually infinite customizations and options” for the interior spaces, with options for shelves and cabinets and electronics. No pricing has been announced yet, but the first Kasita building is expected to be launched in Austin, Texas, in 2016, with 10 other cities in the works for the year after that. Find out more at Kasita.